Hunters looking for a scope that offers long-range accuracy (features Accu-Trac adjustment system) should take particular interest in this Redfield Revolution review because some insight will be shared as to the scope’s practical use. The one question you’ll undoubtedly have as a serious hunter places focus on the Revolution’s deployment range. It’s all well and good having a great long-range scope, but what if you want to use it for shorter distances? Will it maintain the same accuracy and resolution clarity? At a very comfortable weight of 12.6 ounces, the Redfield Revolution weighs in at a full 2.1 ounces less than its Redfield Revenge cousin, but it’s a little bit longer than the Revenge. This scope features a matte black finish that surprisingly blends in with just about any rifle by selectively reflecting the color of the rifle itself, making it more than just a mechanical fit for your gun. Aesthetics aside though, the Redfield Revolution Accu-Range more than holds its own against the elements and is shock-proof in addition to being fog proof and waterproof. You can even remove the dust caps and it’ll still be fully waterproof, so full marks for in-use practicality. Do you have a little bit more to spend than what you would for a budget scope? If that is the case, the Redfield Revolution Accu-Range offers a lot more for the tiny difference you’re willing to pay to break out of the budget price range. One can go as far as boldly comparing this Revolution’s lens quality to that of a Leupold VX-1, except you only pay about half of what you would for a Leupold. Yes, the lens quality is that good — very clear with super eye relief. Looking to sight guns such as those from the Model 111 Savage range, Lewis MT AR 15 or even your 930 Mossberg? The Redfield Revo’s Accu-Range reticle appears to be almost perfectly made for such hand-pieces, but you’ll have to use Leupold rings for the Mossberg and Inchscope rings to mount it on your AR15. 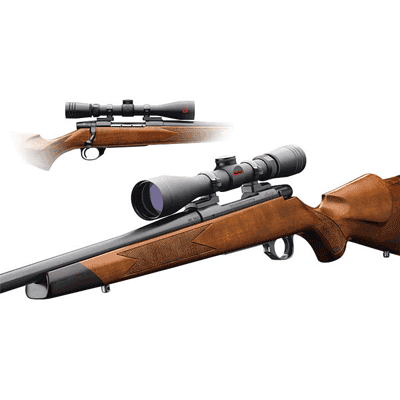 The scope’s deployment specifically with the Long-Range Hunter version of the Savage Arms 111 range pretty much sums up everything it’s about — upscale magnification (magnification over longer shooting ranges). The true value of the scope comes into play when you want to use it for magnification over shorter distances though, because let’s face it — scopes that are normally built for upscale magnification don’t quite have room for lower-end magnification and typically don’t deliver the same performance over shorter ranges. This is where this scope earns its stripes because upscale and lower-end magnification pretty much means you have the functionality of two different scopes in one device. The scope zeroes very quickly and if you don’t manage to zero it in about 6 rounds or so, consider yourself a bit unlucky. 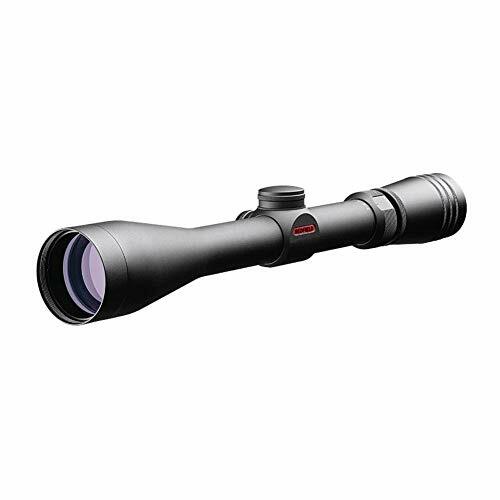 This is indeed an easy-to-use scope that has no issues with glare, with a design that seems to be very durable. Going through the Revolution’s functionality in action might have you thinking that this scope seems a bit too good to be true, especially at its just-above-budget-range price. There is a bit of an issue with magnifications beyond 5x though, particularly with the clarity. Also, although the scope can be zeroed via the turret, the dials don’t have screws so refastening can be a bit of an issue. The scope’s tube is also pretty short, so it might not be long enough to mount on the rails of some rifles. That can be fixed with extended Weaver rings though, but you’ll have to know exactly what you’re looking for when you go check Amazon which offers the most attractive prices. See how this scope compares to those featured in our list of the best rifle scope reviews. In a nutshell, this Redfield Revolution review demonstrates how good a scope this is for any hunting enthusiast on the lookout for a mid-range priced scope that offers superior long-range accuracy in its magnification functionality. You’ll get more than you bargained for though because short-range performance is just as good, especially considering most long-range-geared scopes are explicitly built for long-range performance and fall short in clarity over shorter distances. If you are indeed a hunter, you’ll probably use this scope a lot more often than any other scope you might have.